This is the time of year that I really start craving fresh, raw foods. After a few months of gluttony and heavy eating through the holidays my body really needs a break from heavy rich dishes. Starting today I’m going on a 21 day cleanse to see if I can cut out processed food, caffeine and refined sugar from my diet. I’m not following any particular plan but I’m hoping that I can change some bad habits and feel better in the process. I have been looking at a lot of diets out there and some of them seem so radical I know that I won’t be able to stick with them. I just want to cook fresh healthy food and restore my body and my mind. Eating more healthfully doesn’t mean that I can’t still share some great recipes with you all. So I hope that you will follow along with me as I start this new journey. When I eat a salad like this, bright, clean and refreshing it makes me wonder why I want to eat any other way. 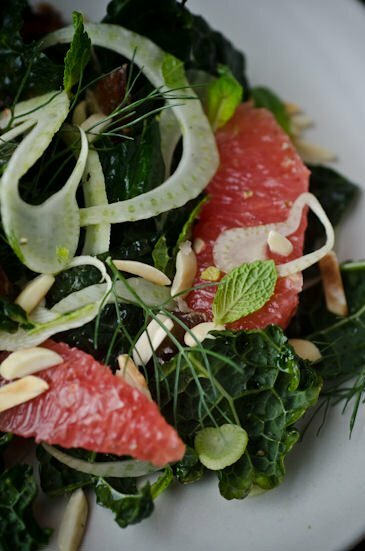 This is a super simple salad starring tart juicy grapefruits. This is a combination that I never get tired of, naturally sweet dates, mint and the licorice flavor of fennel make this one of my all time favorite salads. Combine all the ingredients for the dressing in a small bowl, whisking in the olive oil last. 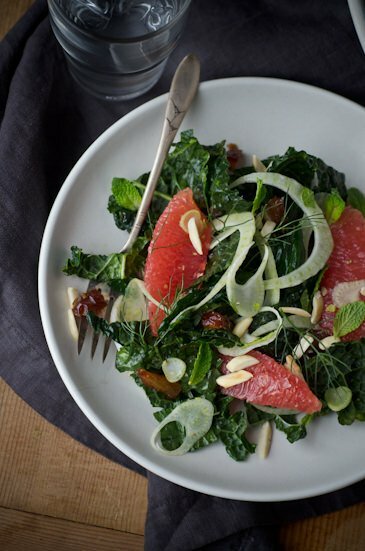 Segment the grapefruit and squeeze any remaining juice from the flesh into the dressing. 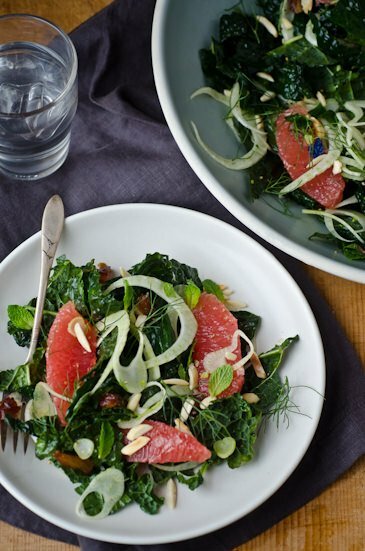 Place the kale and fennel in a large bowl and dress with a few tablespoons of the dressing; massage the leaves with your hands, working the dressing into the leaves. and season with salt and pepper. Add the grapefruit and dates and toss gently to combine. Sprinkle the almonds and mint over the top and serve with a drizzle of additional dressing if desired. 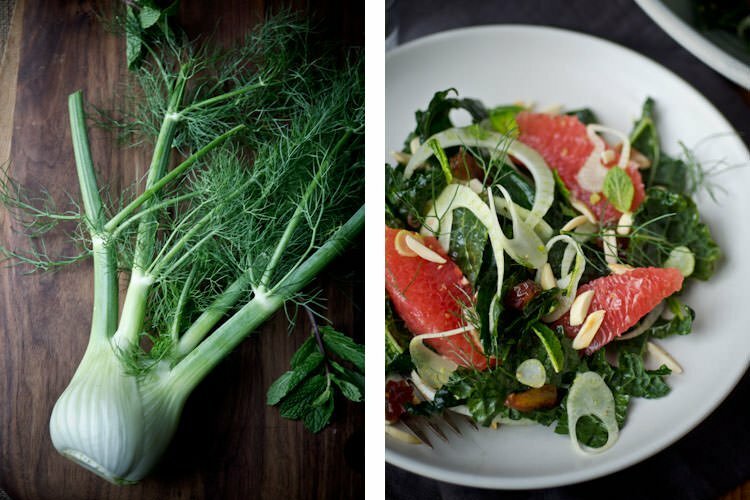 I cannot get enough green stuff on my plate lately, and totally agree with you about the beauty of grapefruit and fennel this time of year. Just recently I made something similar with seared scallops and ginger vinaigrette- it really hit the spot! Here’s to a healthy start! I love scallops! I’m going to have to try that recipe. I just looked at your blog for the first time, wonderful photography! I’ve added it to my RSS feed. Thanks for taking the time to check out my site, it’s appreciated! Delicious salad!!! I followed the recipe exactly and it came out beautiful both in presentation and flavor. Again, as all things in cooking buy the freshest ingredients for an awesome taste. I used 1/2 bunch dinosaur kale and 1/2 bunch chard because this is what I had. Also, I did not have mint on hand, so used fresh parsley instead…though I would be partial to mint. All in all, it was excellent. Great way to have kale!! !